Back to the Future Again | Tennessee Aircraft Services, Inc. I can now say I’m one of the few people in the United States that’s flown a production model aircraft with factory certified installation of a compression ignition engine. The combination of an old favorite airframe in the 182 and an incredibly simple to operate engine made the event seem very, well, normal. Of course, it wasn’t normal at all, but it seemed so familiar so quickly that it felt that way. Several other publications have already written about some positive nuances of flying the J182T, so this article purposefully focuses on the mechanical side of the plane. Having said that, I’m as much pilot as mechanic so I can’t help talking about flying something new. So I’ll start with some mechanic/pilot observations from my flight in the prototype at Wichita. Starting the engine is about as simple as starting a car, with just a few preliminary airplane style checks. After the G1000 gets through all its self checks, the throttle is moved from the stop position to the idle position. If it’s cold enough outside and the engine temperature is below a certain threshold, a preheat switch is armed to get the cylinder heads up to a proper starting temp. Cessna test pilot, Charlie Wilcox, informs me that their testing in Alaska shows this will be a minimal wait time, even on the worst days. Our flight day has ambient temperature in the upper 80s F, way above the need for preheat. Just a turn of the key and the SMA starts right up and settles into a smooth quiet idle. I emphasize quiet because it is noticeably quieter at idle than the avgas 182, normally aspirated or turbo. Some very precise timing between the high pressure fuel pump and the crankshaft position make for this much quieter operation at low RPM. It may be quieter in flight as well, but my last flight in a 182T or T182T isn’t current enough for an honest comparison. Engine response to throttle movement is very direct. In normal mode, the throttle isn’t mechanically connected to the engine. Instead, it sends electronic position information to the Electronic Control Unit (ECU), which in turn positions the fuel pump rack as needed. This makes for even and smooth throttle control over the entire movement. SMA points out that this engine doesn’t technically have Full Authority Digital Engine Control (FADEC) because the prop governor is hard set to 2200 RPM limit. When applying power for takeoff, the 2200 RPM limit is reached quickly and stays there for almost the entire flight. It’s very “turbine” feeling and simplifies the flying experience tremendously. We climb to 10,500 feet where the engine still makes 98% power to check out the cruise speed. It is pretty impressive to see 157 KTAS on 11.8 gallons per hour. We pull the power back to 90% and make 155 KTAS on 10.8 gallons per hour. With this engine, 100% and 90% are perfectly acceptable cruise power settings. Since the RPM is permanently set at 2200, and the ECU takes care of all the engine monitoring and miniscule adjustments, there’s nothing else to do with the engine during cruise – no tweaking, no leaning, no nothing. After several decades of monitoring multiple engine parameters constantly during any given flight, I must confess it is a little uncomfortable having nothing to fiddle with for engine operation. One just sets the percent power and that’s it. Then, Charlie Wilcox has me pull the red lever, to the right of throttle, into backup mode. The function of the red lever is to switch fuel pump control from the ECU to a mechanical link between the power level and the fuel pump. I am sure this will invoke some significant difference in engine feel, but it is very anticlimactic. We drop maximum power from 230 hp to around 200 hp. This is still over 85% of the 230 horsepower, which is more than most of us are used to using for cruise, so it is no issue at all. Backup mode is somewhat more interesting for me as I now have some reason to pay attention to the various engine gauges. Maximum manifold pressures are displayed on the instrument panel just above the throttle quadrant so I could easily compare with the large analog pressure gauge. With the throttle full forward, the maximum pressures don’t approach the limits at the normal lower altitudes where the 182 flys. All is well until the landing roll out. The engine can’t be switched back to normal mode while running, so the pilot is in charge of maintaining idle speed after landing. This is when one discovers just how much the ECU does. Of course, if one has to switch to backup mode, keeping the engine running after landing isn’t a major concern. I’m able to maintain idle speed of 800, plus or minus 100 RPM, while taxiing back to the hangar, but it is a fun challenge. The utter simplicity of engine operation is one of the most impressive parts of this engine installation. The elimination of magnetos, waste gate, mixture control, and prop control make flying this airplane a total revolution for most pilots. Even in backup mode, the operation proves less cumbersome than an avgas engine. The operator experience is one of the nicest I’ve ever encountered. Access to the engine for scheduled maintenance items looks to be pretty good. Even better is that scheduled maintenance intervals are much longer on this engine compared to the avgas engines. Oil changes are recommended at only every 100 hours. SMA recommends compression checks only every 600 hours, but they still have to be performed at every annual inspection to satisfy the antiquated requirements of FAR 43 Appendix D Scope and Detail for an Annual Inspection paragraph (d)(3). The turbocharger has a recommended 600 hour inspection with 1200 hour overhaul interval. Engine overhaul is recommended at 2400 hours or 12 years. There are no FAA required airworthiness limitations for this engine. I was able to attend the first SMA engine maintenance training class held at Tarrant County College near Fort Worth, TX, for Cessna Service Stations. Darrell Irby and Ray Bacon did an excellent job under the watchful eye of Thierry Saint Loup, Vice President of SMA Engines. This being the first class for the new Cessna installation, everyone was getting some experience with the process. The engines used in the training did not have the oil cooler or induction air cooler installed, so they looked a bit naked. In addition to that, there was the obvious lack of magnetos, plug wire harness and spark plugs. Other than those omissions, the engine looks much like piston engines flying on most other Cessna singles. In fact, I think this may help the engine gain acceptance more quickly in the general aviation service community. One challenge with an air cooled combustion ignition engine is keeping cylinder head temperatures in a proper range. 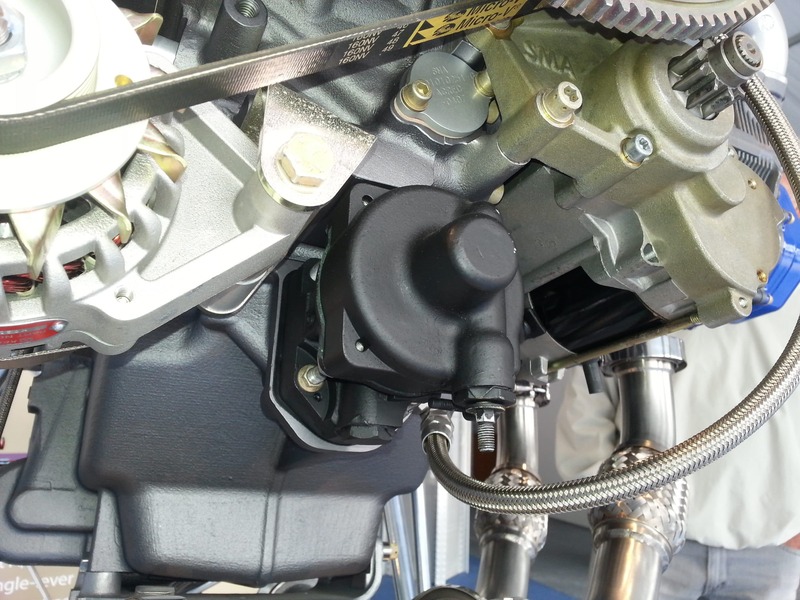 SMA chose to circulate engine oil around the exhaust and intake valve seats as a primary cooling method. The resulting small cooling fins on the cylinder heads gives the engine a slightly different look than its gasoline powered counterparts. The only problem I could think of is the possibility of the oil passageways around the exhaust valve seat getting restricted due to coking. SMA reports no issues in this regard so far. The heart of the fuel system is the Bosch fuel pump. Note the heavy walled lines to deliver the 16,000 psi fuel to the injectors. The fuel pump is a well proven Bosch system mounted on the back of the engine. This isn’t your wimpy gasoline pump that puts out a measly 20 or 50 psi. This bad boy puts out 16,000 psi directly to the injectors. 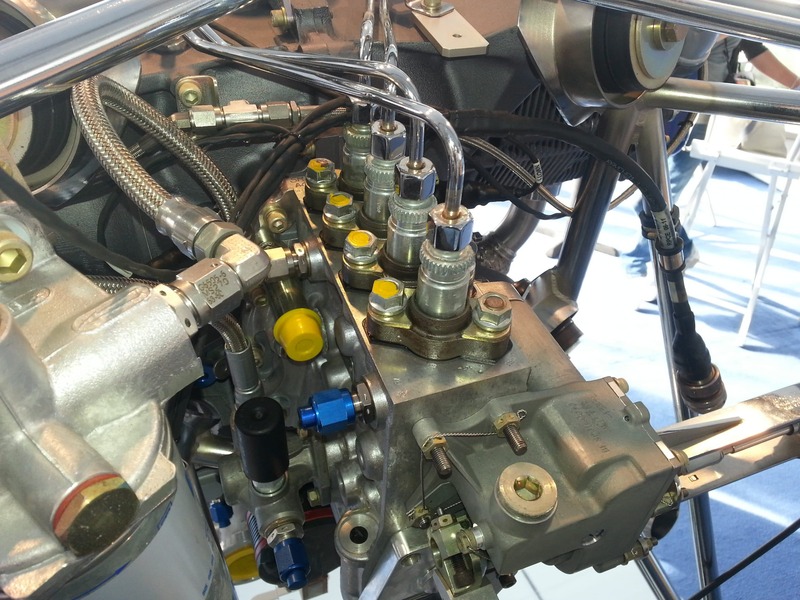 The hard lines that deliver the fuel from the pump to the injectors have very thick walls to handle the pressure. Due to the high stress on these lines, SMA requires replacement after a very limited number of removals. Read that to say: don’t loosen the fuel line nuts unless absolutely necessary. Every engine manufacturer must invent a way to number the cylinders. Lycoming starts at the front of the engine and works down the crankshaft. Continental starts at the back and goes to the front. This makes for really strange numbering for the order of firing. SMA decided that cylinder numbering would follow firing order. It’s very easy to determine which cylinders are which by following the injector lines beginning at the front of the fuel pump. The line coming off the front of the pump is #1, then following in order to #4 at the rear. Just trace each of these lines to a cylinder to determine cylinder number. The fuel supply filter is a simple spin-on filter that looks like a miniature oil filter. Installation is simple. Just wet the seal with some clean engine oil, then fill the filter with fuel. Installation is just as simple. Spin on by hand and make a 3/4 turn after contact with the mount. There is a simple process to purge air from system and then all is ready to run. The oil filter is mounted inside the oil sump and looks like an old style cartridge filter. Removal is as simple as removing a large snap ring, taking the cover off, then pulling out the filter. Installation is reverse of removal. Prop governor, in black, with no external controls. The prop governor is mounted on the front of the engine below the prop shaft. It looks a bit different than most because there isn’t any control cable attached. While it may look odd just sitting there by itself, no external control is needed because running RPM is preset to 2200. Compression ignition engines are always running lean of peak and need a lot of air. An exhaust driven turbocharger is used to produce manifold pressures in excess of 80”. That’s at least double the typical turbocharged gasoline aircraft engine. The system is designed with no wastegate for control. The turbo runs as fast as the exhaust provided will turn it. This reduces weight, parts count and simplifies maintenance. It’s important for mechanics to be familiar with the configuration of the engine, but it’s far more important to know how to work on it. There are some major differences in how this engine gets mechanical attention. If you’re fortunate enough to buy one of these planes, be absolutely sure no mechanic touches it unless they’ve attended the factory training. It’s not rocket science, but there are certain old school practices that, if applied to this engine, could prove very costly. I’ve heard a lot of comments about this installation being heavier than the avgas powered 182. Just to get the numbers straight, Cessna provided preliminary actual weights of the variations on the 2013 182 models. A normally aspirated 182T standard empty weight is about 1967 pounds. The T182T standard empty weight is about 2072 pounds. Since the J182T is the replacement for the T182T and both are turbocharged, it seems proper to compare those two. The expected spec weight for the J182T is about 2092 pounds. There are some variables built into these numbers, and at this writing the authorized numbers are yet to be published. For years, owners of the T182T have accepted the 105 pound penalty to get turbocharging so it another 20 for JetAshouldn’t be a big deal. Of course, we still need to address jet fuel weighing about 11% more than avgas. In the general aviation world, we’ve been properly trained to not trust our fuel gauges. As a result, we are spring loaded to only depart with topped off tanks. While this isn’t necessarily a bad thing, it does make an apples to apples comparison between a combustion ignition powered plane and an avgas powered plane difficult, even unfair. If both planes are filled to the brim with fuel, it is true that the J182T has a good bit less payload available in the cabin than the T182T. If one considers the J182T maximum fuel capacity as excessive and fuels the plane according to the cabin load, the comparisons actually begin to lean in favor of the J182T. The mathematics of using 40% less of 11% heavier fuel works well for the SMA engined 182. As I alluded to earlier, the real difference this time around is that an FAA certified combustion ignition engine is installed in a mainstream current production airframe of a large domestic manufacturer. This adds a level of validity to the possibility of a combustion ignition engine that this industry hasn’t seen before. I’d always expected a new combustion ignition engine to arrive on a new airframe. As it turns out, this pairing of old and new offers us the ability to see what differences the engine really makes. 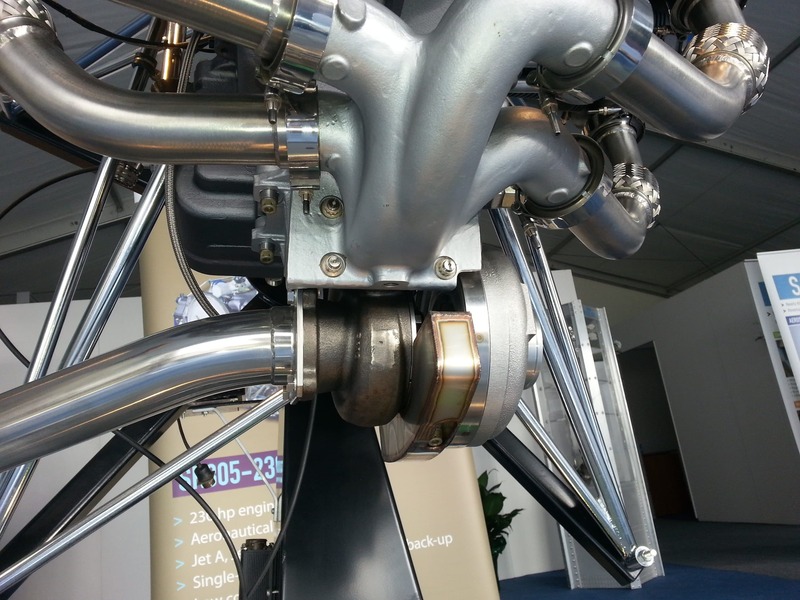 It’s very early to make predictions about the success of the SMA engine or combustion ignition engines on small aircraft. This new/old technology has all the earmarks of something great, but only the future will tell. For sure, it’s going to interesting to watch.